It takes a simple google search to find HUNDREDS of solar eclipse activities for a classroom, but how many of those activities are written in such a way so that students are the driving force behind the learning and not the step-by-step directions? I’m not saying if lessons aren’t inquiry-based they are terrible science lessons but I am saying that we should be involving our students in as many investigations as we can where they are doing science like a scientist (science and engineering practices), and thinking about science like a scientist (crosscutting concepts). Don’t let a “ready-to-go lesson” blind you from the importance of 3-dimensionalizing our science lessons. We should still be evaluating these lessons and adapting them for our classrooms as needed. First I found a lesson, it’s #11 from this set by NASA. 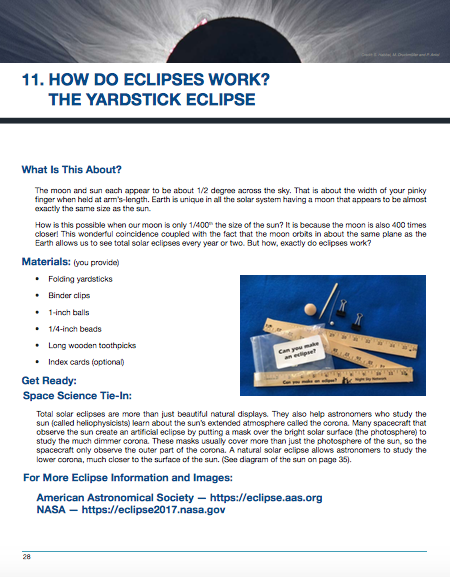 Typically you should also identify what standard you are addressing but because this is such an exciting current event I think ALL sciences should include an eclipse activity! 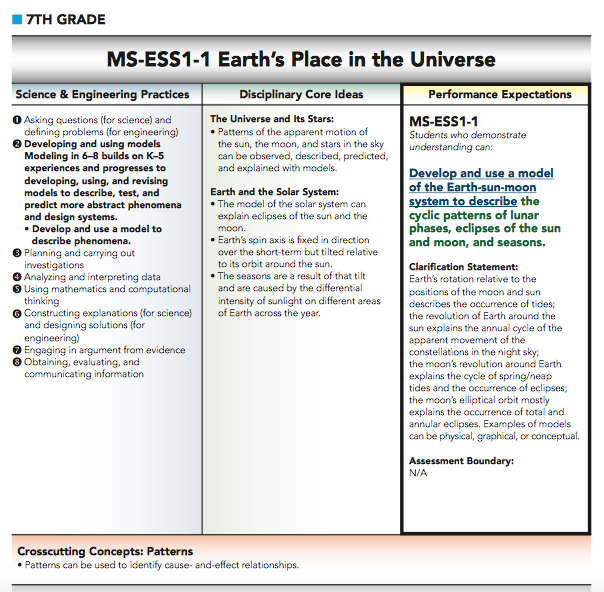 Science is awesome and I love taking advantage of showing this to them whenever possible 🙂 For this write up though the standard I will be addressing and writing the lesson plan for is a 7th Grade Earth and Space Science Standard (MS-ESS1-1). I read through the lesson to get a gist of what it wanted students to do. Now instead of simply giving all students a copy of this lesson I wanted to change it up so that students were driving their own learning, rather than simply being told what to do. One great driver of student learning is having them come up with questions about the phenomenon you are presenting. 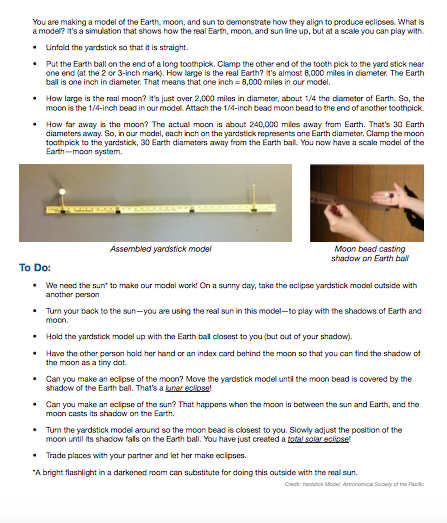 So first thing students do will be “develop questions about the solar eclipse.” This isn’t the only thing they should be doing so I’ll include “carry out an investigation” so that they can gather observations/evidence to answer their questions, “develop models” to illustrate what is happening during an eclipse (this also happens to be the SEP in focus for the standard), and “constructing an explanation” so that they can communicate what they are learning. What about the solar eclipse should their questions focus on? Well that’s up to them but I do have an end goal (MS-ESS1-1) so I will direct their questions by using crosscutting concepts – the ways of thinking about science. Which CCC should I use? The standard suggests “patterns” so I will definitely include that but I will also include “causes“….it’s probably my favorite lol And I typically include “systems” because it reminds students to focus their observations. These are the three CCCs I’ll mention over and over again to keep them focused while they are learning about the solar eclipse. ***Remember: I don’t give the entire process to my students at once. It’s typically on a powerpoint so that I can give students each piece as we move along. It helps to keep students from being overwhelmed and it helps keep pace so we are paying attention to the time. Looking at the image, define the system and develop questions about the patterns and causes of a solar eclipse. 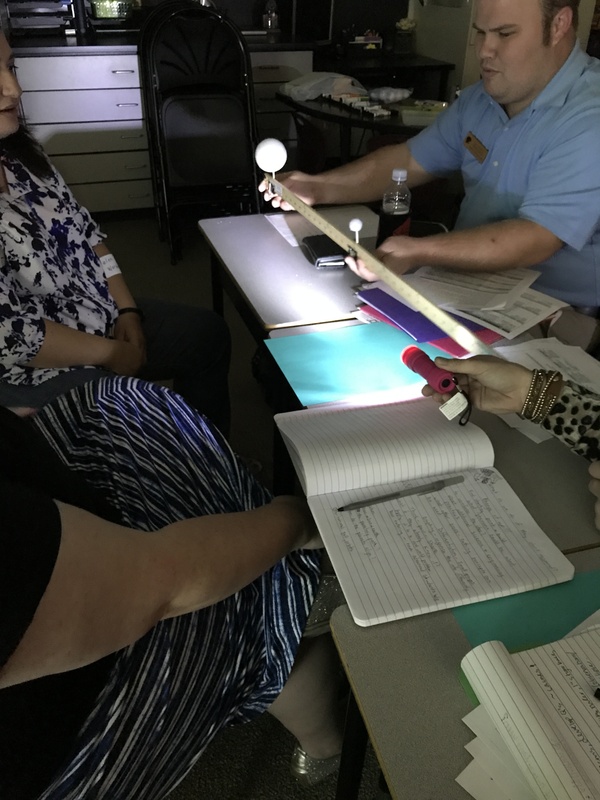 Using the provided materials, carry out an investigation to gather information (observations) about the causes of a solar eclipse. Draw a model that represents your investigations. Using the CER model (claim, evidence, reasoning) construct a preliminary explanation for the causes(s) of a solar eclipse. Remember to include the evidence gathered from your investigation. Group Discussion: Have students share their information then revise their explanations if needed. Using online resources (or you, the teacher, can provide this! ), gather information that supports/refutes your preliminary explanation about the cause(s) of a solar eclipse, revising if necessary. Gather information about the cyclic patterns of a solar eclipse, including this in your explanations. Group Discussion: Have students share their information then revise their explanations/models if needed. Is this lesson perfect? Nope and that’s okay! What is important is that I’ve adapted an activity about the solar eclipse so that it better represents the learning I want my students to do. It has students doing the work, thus making the discoveries! Purposeful thinking is happening due to the crosscutting concepts helping to direct student learning. You know what the best thing is? Students will be having fun since they are doing something rather than being told what to do. Whatever you do on August 21st, I certainly hope you are able to take advantage of the exciting phenomenon and share the wonders of science with your students!